The writing came quite easily to the author, who wrote the first draft of Robert McCloskey in a few days. "I wrote for 16 hours each day," she recalls. "Once I started, I just couldn't stop. Then I let it sit for six months or so to marinate before I went back to it. I realized I still liked it, made changes, and expanded it, and then I decided to look for a publisher." Jane McCloskey, daughter of two-time Caldecott Medalist and three-time Caldecott Honor artist Robert McCloskey, has collected her memories of her father in Robert McCloskey: A Private Life in Words and Pictures. Due in July from Seapoint Books, the book is illustrated with artwork from McCloskey's picture books, including Make Way for Ducklings, Blueberries for Sal, and Time of Wonder, as well as many never-before-published drawings and paintings found in the artist's studio after his death in 2003. Writing a biography of her father wasn't a long-standing plan for Jane McCloskey. "I just sat down one day and started writing it-I really have no idea why," she said. "I guess I wanted to say good bye to my parents, to thank them, and to tell them that I love them. But when I was writing the book, I wasn't thinking about why. I just wrote." After Viking, her father's longtime publisher, passed on the project, McCloskey showed the manuscript to Spencer Smith, a family friend and publisher of Maine-based Seapoint Books, an imprint of Seapoint Books, who expressed interest. "Jane has been a friend of mine since I was a teenager, but I didn't know she was working on the project until she showed me the manuscript," Smith. Said. "There has never been a biography of Bob, and his books have meant a lot to three generations of children. He was a diffident, shy man and didn't talk about himself at all, and I think readers will be eager to know more about him. His world-his family, his island in Maine-were very real in his work, and now people will see his books in a larger context." 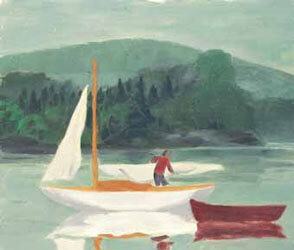 Smith was surprised to learn of the wealth of art that Robert McCloskey had created in his studio-which still stands intact on the family's Maine island-after he finished publishing children's books (the last one he both wrote and illustrated was Burt Dow, Deep-Water Man in 1963). Jane McCloskey herself hadn't realized the extent of her father's later-in-life output. "We discovered a lot of paintings no one had ever seen," she said. Commenting on her father's transition from creating children's books to painting for himself, McCloskey reasoned, "I think he felt like he had taken his books as far as he could. He didn't like to repeat himself and liked to break ground with each of his books, to try out different things. I think he felt that after his last books, Time of Wonder and Burt Dow, there was no where to go but down, so he wanted to skate out in a different direction entirely." She found writing the book gratifying and a bit surprising. "I was amazed at how the process of remembering makes you remember even more," she noted. "Things kept emerging from the past. Sometimes I felt as though I was almost channeling my father, and that he was looking on, blessing me. No, that's not a word he'd ever use. It was more that he was giving me his approval. And that was wonderful." 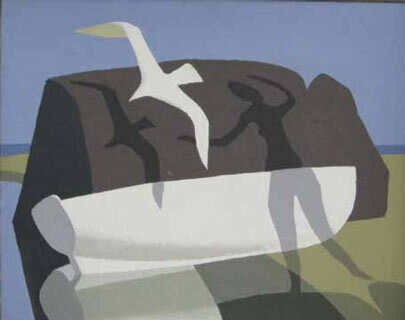 Robert McCloskey: A Private Life in Words and Pictures by Jane McCloskey.